Welcome to WHMISdirect.ca. 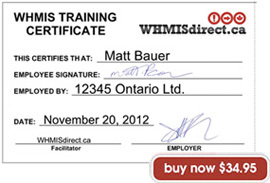 WHMISdirect.ca is the trusted source of online WHMIS 2015 training for thousands of first time and refresher WHMIS GHS training students. WHMIS 2015 is federally legislated training required for any workers who manufacture, work with, or are in proximity to controlled products in their workplace. Start your WHMIS 2015 training today! Complete the online course & get your certificiate. Get the required training for your employees. Our online WHMIS training course is nationally recognized and accepted throughout Canada, in all provinces and territories. Our course now includes GHS awareness. Upon course completion, PDF certificates are issued immediately. WHMIS Certifications are transferrable between provinces and training history is made available through your student account for review at any time. All training records are stored permanently on your student ID. This information is available to the account holder on demand if there is ever a need to reference your training history or print new certificates. Learn the benefits of doing your individual or company safety training online with WHMISdirect.ca in the video below. Transportation of Dangerous Goods Regulations (TDGR) training is required for people who handle, offer for transport or transport dangerous goods. TDG training online: Only $34.95! WHMIS GHS and TDG bundled together: Only $69.90! NEW! Anybody required to use “fall protection equipment” must be trained and competent in its use and care. Fall Protection Awareness Training online: Only $64.95! NEW! This program is an excellent review for experienced forklift operators as well as an introduction for new operators. Forklift Operator Safety Awareness training online: Only $94.95! NEW! This course provides an overview of working safely with Hydrogen Sulfide (H2S). Hydrogen Sulfide (H2S) Awareness training online: Only $54.00!